How do you handle HTML 5 with many browsers still not supporting it? wow your site is really cool. i hope i can design as well as you someday. I love the work you have done on this project. You have obviously put a lot of time and effort into it, and it shows. Congratulations! Awesome! Simply stunning! It is really full of styles. Very nice. Media queries is a great way of handling the transition between large and small screens and can be hugely effective if used right like you have. I’ll use your site as my example next time I talk to people about the virtues of moving to HTML5 and CSS3 today. This is no doubt very creative work with good technical approach. Liked your work. Love the new look! Great use of media queries, excellent cross-browser integration. 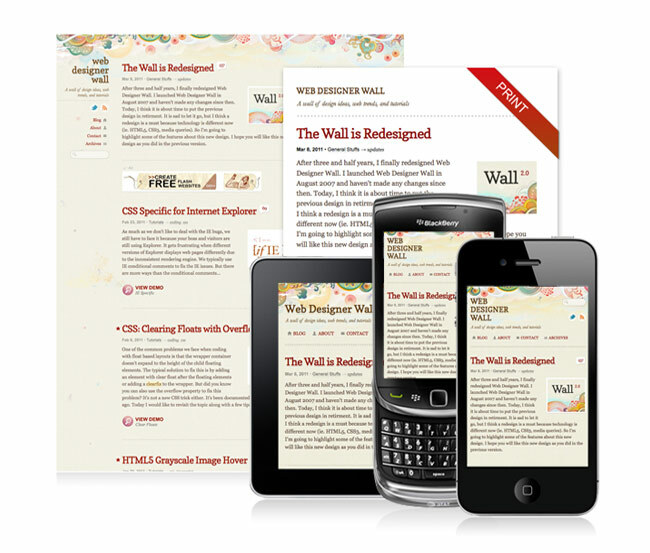 I continue to be a devoted reader of webdesigner wall! I liked this theme. It is very clever to keep the left column static. It saves spaces on the top. You should add categories in left as well for easy accessibility. Awesome job Nik. Looked a bit at the code and as always its immaculately well coded :) Also well done for managing to use HTML5 and CSS3 and yet make it still look good on the older browsers (namely IE7 and IE8). So kudos in all respect! very nicely done stylish design with excellent coding (any code that runs on ie7 with such creative design is excellent to me). Like your style. Very unique work as always.